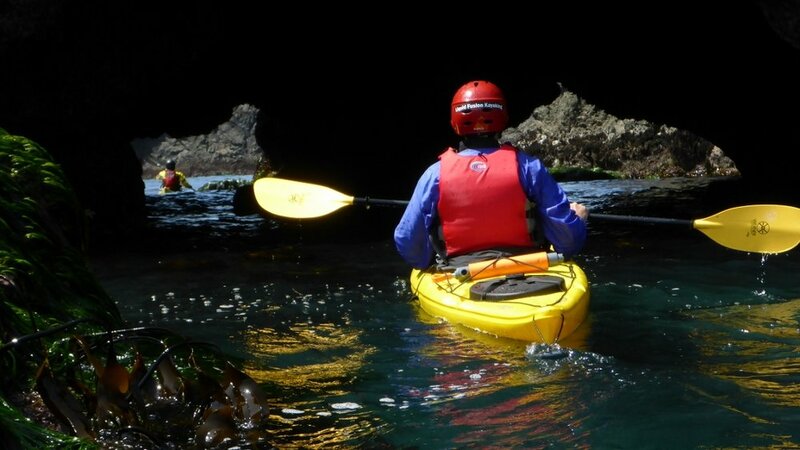 Experience the magic of sea kayaking into Mendocino's sea caves. We will share the tips n tricks for exploring sea caves as we spend 2 full days journeying into our favorite caves, arches, and tunnels on the Mendocino Coast. Prerequisite skills include ability to swim 25 yards with your equipment, fitness and paddling skills to paddle 6 miles, maneuvering in tight spaces, paddling backwards with control, bracing, being able to paddle as a group, and self and buddy rescue skills. Dressing for immersion (wetsuits or drysuits) is required. We highly recommend taking Liquid Fusion Kayaking's Touring Ocean Rock Gardens Class prior to this class. $270/person (paddlers using their own sea kayaks and equipment). Sea kayak and wetsuit rentals are available.